Determined to see all the courses at French Lick Resort, I boarded the trolley that circulates guests around the property early one morning to visit the Valley Links Golf Course, the resort’s oldest venue. Built in 1907 by Tom Bendelow, the Johnny Appleseed of Midwest golf, the Valley Course, as it was known back in the day, functioned as a championship-caliber 18-hole test for nearly a century. After the Cook Group acquired the resort, the layout was refashioned through a partnership with U.S. Kids Golf into the walker-friendly, family-friendly 9-holer that exists today. At least that’s what director of golf Adam Marshall told me before toweling off the dew on the seat of a golf cart and pointing the way to the first tee, where my exploration of the links would begin. As with many courses built long ago. Bendelow, with rudimentary earthmoving equipment at his disposal, took the path of least resistance and sketched his holes across the flat valley floor. This old charmer is an out-and-back, lay-of-the-land design with a few well-placed bunkers and a meandering creek in play to keep things interesting. There’s one hill on the course. It provides an elevated tee shot on the second hole and a neat little downhill par 3 at the seventh. Much lip service in the golf industry is paid to growing the game and getting beginners started on player-friendly courses that enable them to have fun and experience success. The par-36 Valley Links has six sets of tees ranging from 3,518 yards from the Bronze markers to a petite 1,111 yards from the Family Yellow tees. (For big-hitting tots, the Family Green tees are 1,900 yards). That’s a lot of versatility. A golfer of any stripe or caliber can enjoy this well-groomed, parkland-style layout. But be mindful, the Valley is no pushover. The greens are small and tightly guarded. 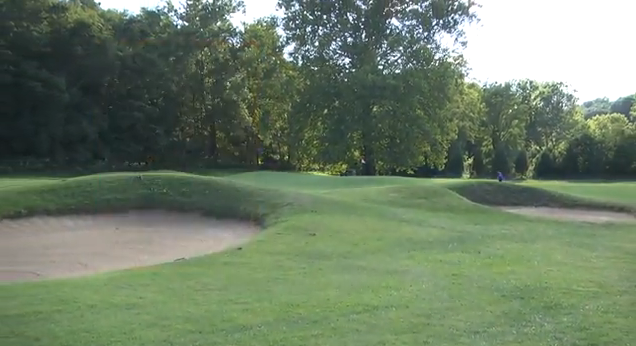 The bunkers are in all the right places. “We’ll be softening the Valley Links in the near future,” confides Dave Harner, the resort’s director of golf operations. Even from 1,111 yards, players are required to loft shots over the creek at a few holes. The course, by the way, is free to kids 12 and younger, with U.S. Kids Golf loaner clubs available. Back at the clubhouse, I was impressed by the Golf Learning Center, which, in addition to an outdoor practice area, features an indoor putting green and a 10-station indoor driving range with a large net at the far end that protects the tennis courts at the far end of the building from bombardment. The French Lick Resort Golf Academy offers expert full swing as well as short game instruction plus state-of-the-art video swing analysis and custom club fitting. If proficiency in the game counts, I’d consider taking a lesson with Adam Marshall. With our round on the vaunted Pete Dye Course still ahead of us, I innocently inquired about the course record from the tips at 8,102 yards (par 72). “The course record is 71,” Adam said. “And when did you shoot that?” I joked. Fun describes the Valley Links, French Lick’s under-the-radar old-timer that will be even more fun once a few of its sharper teeth are softened.